One of my goals and dreams is to be a person who reacts first--to any situation--with love. So whenever a book comes along that teaches basic concepts to guide me along this path, I jump at the chance to read it. ... Scroll down to the bottom of this post for my complete review. Feel the greatest love. Experience the greatest love. Embody the greatest love. The greatest love is love that truly lasts and has no conditions. It is the love of a mother for her child. It is the love we read about in poems. It is the love we long to have. We all have challenges that keep us from experiencing this greatest love. These challenges may present themselves in your health, relationships, or finances. With this book, learn how to unblock your life in 30 minutes a day with the power of unconditional love, the greatest love, which surpasses the human and enters the love of all creation. Practice the simple, joyful exercises within this book, and receive powerful blessings from Dr. and Master Zhi Gang Sha, a world-renowned healer, humanitarian, spiritual master, and 11 time New York Times bestselling author, Master Maya Mackie, who also embodies the purest love and compassion, as well as Master Francisco Quintero. The power of greatest love can melt all blockages and harmonize all separation and all that is not love. Carry this treasure with you to apply its wisdom anywhere, anytime, to enrich and bless your health, relationships, finances, intelligence, and every aspect of life. Dr. and Master Zhi Gang Sha is a medical doctor trained in Western medicine in China and is certified in Traditional ChineseMedicine and Acupuncture in China and Canada. A renowned spiritual teacher and 11 times New York Times bestselling author of 24 books, he is also a Grandmaster of several Eastern Arts, including qi gong, kung fu, Tai Chi, feng shui, and the I Ching. He has been recognized as a Shu Fa Jian (National Calligrapher Master) and appointed to the position of Yan Jiu Yuan (Honorable Researcher Professor) by the State Ethnic Academy of Painting in China. Master Sha is also the founder of the Love Peace Harmony Foundation, dedicated to raising consciousness worldwide and to helping to provide direct assistance to people living in need. He has received widespread recognition for his humanitarian work, including the Martin Luther King, Jr. Commemorative Commission Award, the honor of September 21, 2014 being named “Dr. and Master Zhi Gang Sha Day” by the Council of the City and County of Honolulu, Hawaii, and Commendations from both Los Angeles County and the Hawaii Senate. Master Maya Mackie is a UN Ambassador for Peace and a Certified Master Teacher, trained by Master Zhi Gang Sha. Born in Lebanon, as a young child Master Maya lived with her family in West Africa and observed the great inequality in living conditions and opportunities that exist in the world. Now based in Europe and a mother of three children, she is honored to support the United Nations development programs through fundraising events for the underprivileged and underdeveloped areas in Lebanon and the Middle East. With compassion and unconditional love, she offers classes and workshops worldwide, teaching spiritual wisdom and practices. Master Francisco Quintero is a Certified Master Teacher trained by renowned spiritual teacher and humanitarian Master Zhi Gang Sha, and the author of Divine Joy: How to Find Joy in Daily Life. A leading teacher at the Tao Academy™, Master Francisco has developed training programs worldwide. With his expertise, wisdom, and knowledge, he has assisted in training over 6,000 soul practitioners and teachers around the world. 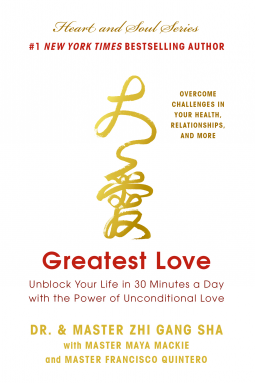 GREATEST LOVE, by Dr. & Master Zhi Gang Sha and co-authors, Master Mackie and Master Quintero, is a pocket-sized book with nuggets of truth, which can transform lives when practiced regularly. As with Master Sha's previous book, SOUL OVER MATTER, this book also contains quite a bit of repetition and translation. However, with GREATEST LOVE, I began to recognize the value of the repetition as almost a form of meditation and acceptance. I'm not quite sure I grasp the necessity of the constant translation of words from "ancient Chinese wisdom" into English. I understand there are different frequencies associated with different words chanted, but I would think that the energy behind the message would be equivalent no matter the language. With that said, I found it fascinating to read about and even master the various phrases. Another item I found more interesting in this book than his other book I've read is the concept of tracing calligraphy. In GREATEST LOVE, Master Sha relates the practice of tracing to tai chi, which utilizes the forces of tai ji--the ying and yang behind the movements. He writes, "Millions of people worldwide practice the sacred ancient movement and wisdom of tai ji to benefit their health and for stress reduction, longevity, and more" (page 44). That was an "a-ha" moment for me while reading. "You are what you think," is a common phrase heard in the United States, and Master Sha writes, "What you chant is what you become" (page 11). He recommends keeping the chant "Da Ai" in our foremost thoughts. Da Ai means greatest love. Master Sha teaches within this small book, GREATEST LOVE, techniques for creating amazing transformations within our lives by tapping into the energy of love.